People often forget to read the most important part of a credit card agreement, that is called the terms and conditions, aka “fine prints”. 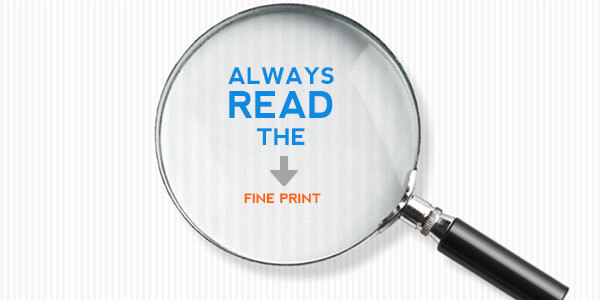 But to avoid paying extra penalties and fees, we must know why checking the fine print is necessary. Before signing a credit card agreement, people usually think only about the interest rates. But many of us forget that it’s vital to check if there’s any annual fee, additional charges on balance transfers, or any other hidden charges. If you’re getting a card with 0% interest, you must find out the exact time when that interest rate will increase. Apart from the usual terms & conditions, you also need to check other factors like your credit limit, arbitration agreements, variable interest rates, fees oriented to international transactions, etc. You may find these sections at the bottom of the web page. One of the most crucial aspects which you need to check in the fine print is the rate of interest charged by the credit card companies. You have to pay interest on your outstanding balance on the card, So, you must verify the interest rate before signing the agreement. if you’re getting a 0% APR benefit, don’t forget to check the fine print to know how long the rate is valid. Usually, after 21 months the introductory offer expires and the rate increases. However, the introductory period may vary. You must also need to know what will be the standard APR for purchase at the end of the introductory period. If you want to opt for the balance transfer method, you must check whether the APR for balance transfers is same or lower than the APR for purchase. You’ll find many credit cards that'll offer you a $0 annual fee for the first year. While several credit cards don’t have any annual fees, these cards start charging you after the introductory term ends. So, it’s important to check the words, written under the “fees” section, for such hidden annual fees. Also, don’t forget to check under the “penalty fees” part. This section will clarify about the charges you need to pay if you make a late payment or exceed your credit limit. If you travel abroad a lot, you must look if there is a foreign transaction fee, based on your every international transaction you make in foreign currency. The same thing you must also check regarding the balance transfer fee before transferring balances. Are you looking for a reward credit card offer? Let me tell you that most reward programs come with some restrictions. Read carefully if there are any caps or limits on points/miles you can get or there is any cap on the cashback amount. Additionally, if you are getting any sign-up bonus, make sure to read about the criteria. There is a certain amount that you must spend on the card to qualify for the bonus. Most of the time the amount is quite big. In the present times, banks are making it convenient for the consumers to get as many credit cards they want. Credit card companies use different promotional tricks - from flyers to promotional Emails, to lure people. But, as a wise consumer, if you read the fine prints and understand all the offers along with the terms and conditions correctly, you can avoid any nasty financial surprise from them. Doing so, it’ll help you handle billing disputes if needs arise. Page loaded in 1.559 seconds.